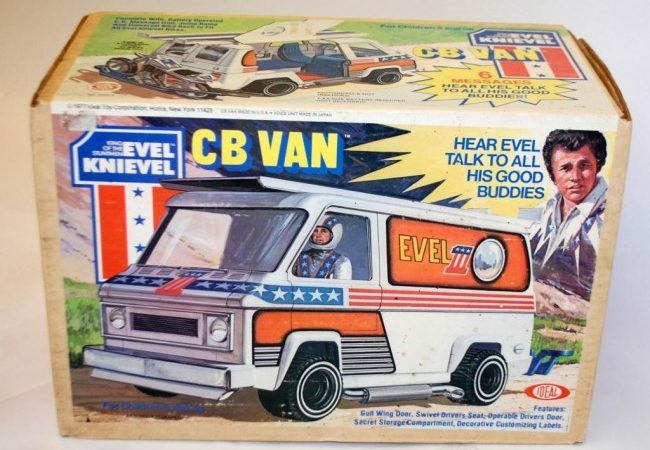 In 1977 Ideal canceled Evel’s contract to produce his toys for the USA market. 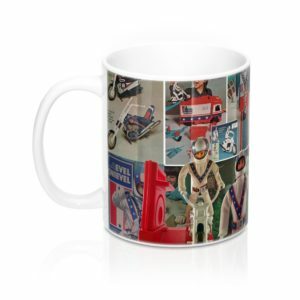 There was a brief period where Ideal licensed the brand to be sold in England. Unilke other English Stunt Cycle sets, this set was not produced by Arxon. 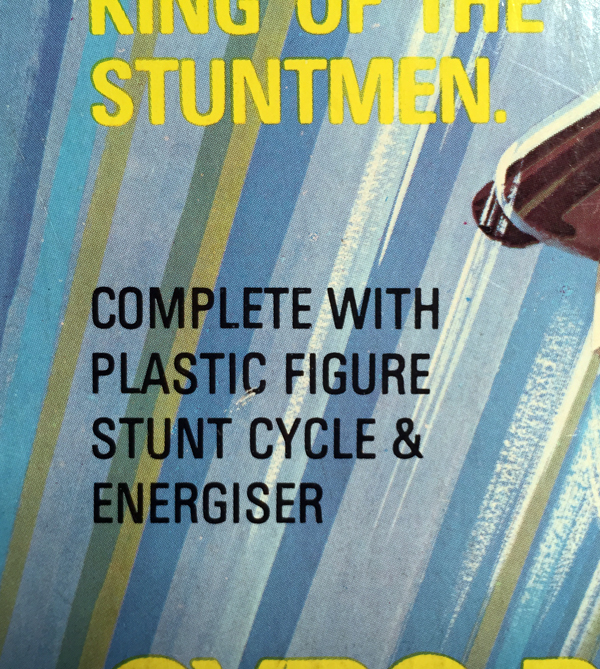 This set had the same graphics as the 1977 US Stunt Cycle however it has some very distinct differences inside the box. The box was noted as having a plastic action figure which was also used in the Team America Stunt Cycle sets. The Bike was a dirt bike. The Evel bike had chrome forks. The rest of the bike was white. The Team America bikes were grey and had black forks (some chrome). 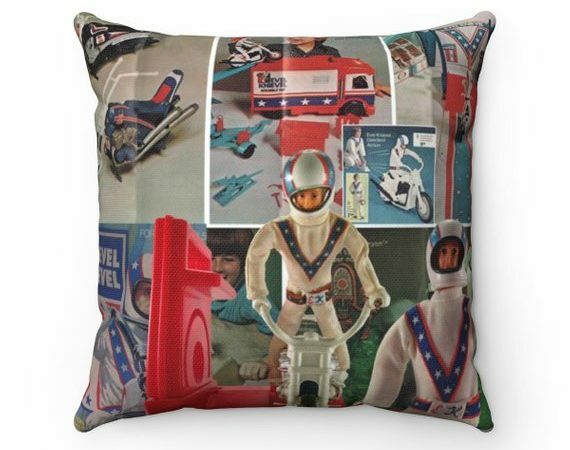 The Evel figure was the only plastic figure that had the stars and stripes. Team America did not. Although the sets did not sell very well they are extremely rare in complete condition. 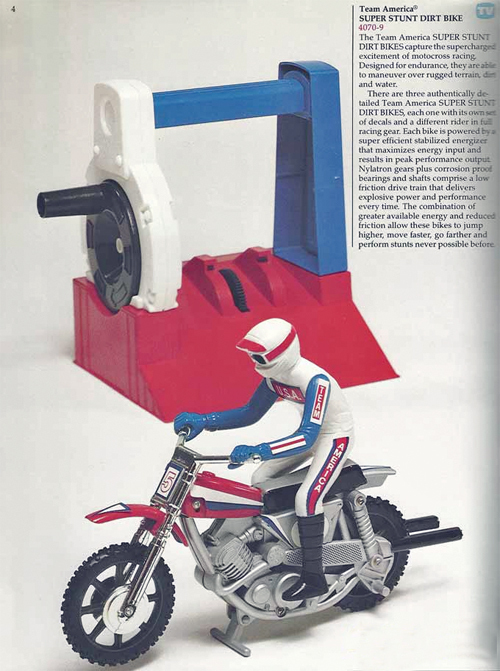 Team America figures and dirt bikes are a dime a dozen, however this issue set is worth money if the instructions and box are complete. Why you ask? First, the box is rare since it mentions the plastic Evel Knievel action figure. 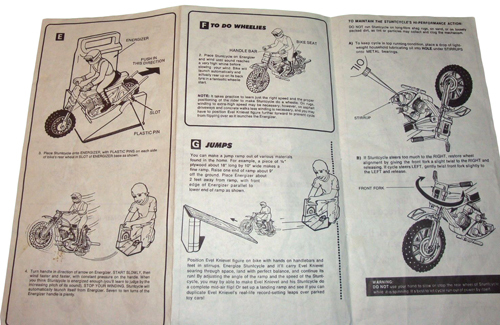 The instruction manual reflects the contents of the box, the plastic action figure and the dirt bike. In conclusion, the value of this set is highly weighted on the having the manual and box more so than having the actual bike and figure. The bikes often have broken handlebars so if you find one in good condition your in luck. The correct Energizer for this set would be a solid color and like his original and not the red and blue launcher that came with the later Team America sets. 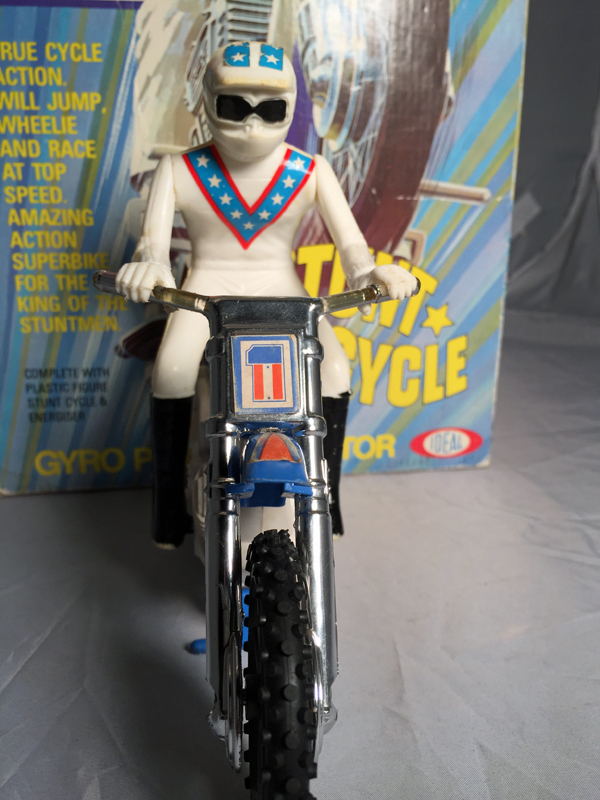 While this set may not ring that nostalgic bell for average collectors it rings a serious cash bell with Evel collectors.They issued so little sets that it is as rare as the Sidewinder Super Cycle but it wasn’t nearly as cool because it had those plastic figures and dirt bike. With that said, If you see one buy it! 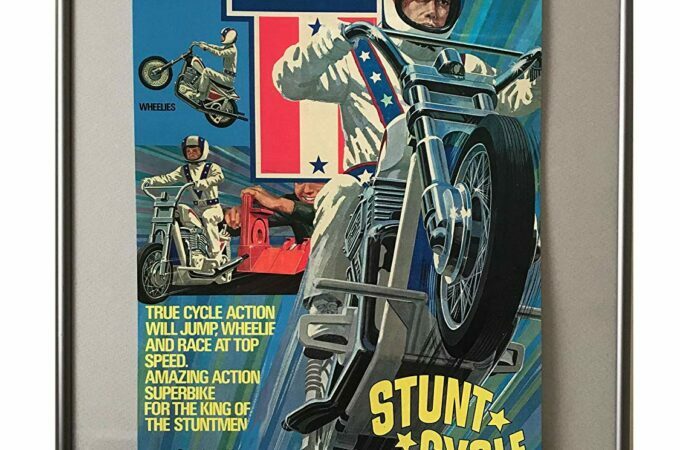 The English “plastic” Evel Knievel Stunt Cycle set is worth approx $400.00 under these conditions. Good box, original instructions,bike has handlebars, figure is in good condition. ** Bleow is the Team America Super Stunt Dirt Bike. 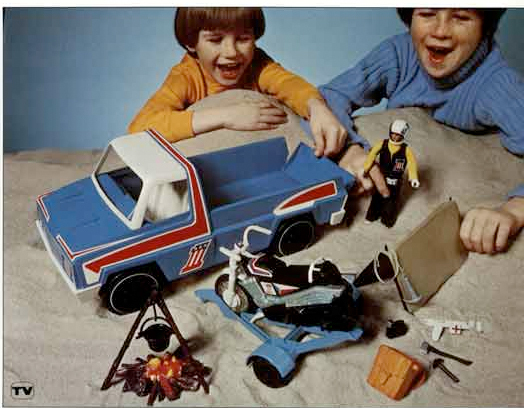 They didnt issue the multi color launcher in the Evel Knievel sets. 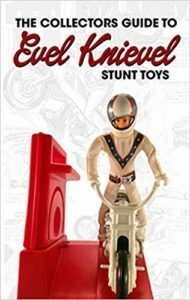 Buy The Evel Knievel Collectors Book!